Plan to dress up for Halloween? Before you choose your costume, grab a calender and figure out which week of your monthly cycle you’ll be on once the holiday rolls around. That’s because your hormones affect your derring-do, flirtatiousness, patience with wigs and props and desire to make a splash based on the week you’re on in your monthly cycle. So, the costume you’d want to wear today, tomorrow or a week from now may not necessarily be the one you’ll be happiest wearing on October 31. Read on to find out which costume you’ll likely prefer according to where it falls in your monthly hormone cycle…. Low-but-rising estrogen in your Week 1 is slowly lifting your mood and bringing out the kid in you. So, you’ll likely want to make people smile when they see you coming, for instance, by dressing up as a clown or a whoopee cushion. Or you may enjoy recreating memories of costumes you wore as a kid, such as, Ms. Pacman or a cowgirl. If Halloween falls early in your Week 1, opt for a comfortable outfit since you may be toughing it out with menstrual cramps and/or low-estrogen fatigue. High estrogen and testosterone are boosting your confidence, desire for romance and comfort basking in the spotlight. So, this could be a perfect opportunity to unleash your inner vixen with an outfit that’s racier than you’d usually wear. Love sci-fi, manga or other elaborate get-ups? If there was ever a right time for a costume with lots of bells and whistles, it’s Week 2 when high estrogen is giving you the patience to deal with multi-piece outfits, props, wigs, make-up and face prosthetics. Rising progesterone is mellowing you out and lower levels of estrogen and testosterone are bringing down your desire to be the center of attention. 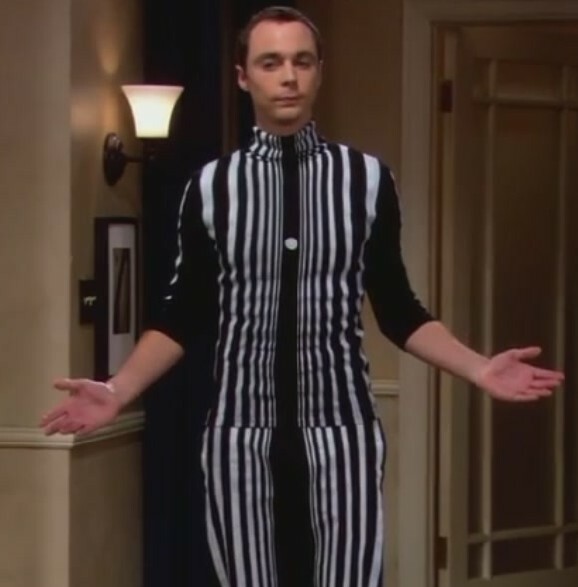 So, this is a good week to plan a costume that’s a bit more on the intellectual side, say, something similar to Sheldon’s “Doppler Effect” or that’s not too fussy, for example, hanging a picture frame around your head so you can go as a “self-portrait”. During this premenstrual week, plunging estrogen makes you more sensitive to outfits that are tight, itchy, hot or uncomfortable in other ways. What’s more, this drop in estrogen is triggering a drop in feel-good brain chemicals, making you a tad more self-conscious about your appearance. So, shy away from costumes that can prompt jokes that may be taken the wrong way (such as dressing up as a cow) and opt for outfits that are easy to wear and make you feel beautiful, like a princess or your favorite female hero.